"River Stone" is a product that always catches my eye at landscaping and garden centers. 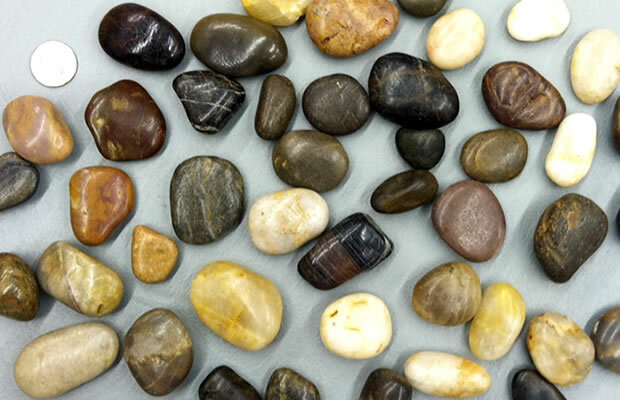 These river-tumbled stones can be beautiful when they come from a river that flows over a variety of interesting and colorful rock types. We have a nice cover of river stones around the shrubbery that borders our home. It contains a variety of igneous and metamorphic pebbles such as granite, schist, gneiss and gabbro. They look great and are especially attractive after a rain when the water enhances their color. Occasionally I have seen river stone for sale that has a polished appearance like the stones in the photo below. This Can't Be a Polish! Although these stones have a wonderful "polished appearance" the polish was not done naturally and the price is too low for them to have been polished commercially. These stones have not been polished; instead they have been "waxed." A small amount of wax has been applied to their surface much like the waxing that is done to some of the apples, peppers and cucumbers that you find in the produce section of your grocery store. If you pick them up and handle them they have a waxy feel. The wax gives the stones a highly reflective surface and strongly enhances their color just like a polishing would do. If these stones are used outside the sun and weather will eventually dull their waxed finish. However, they make a great ground cover for indoor planters and just about any use where they are kept dry and out of direct sunlight. They are also very economical. They cost just a few dollars for a fifty pound bag. They are perfect for projects where you need a lot of stone and the cost of buying polished stones would be much too high.